Understanding clouds, that cover 60 per cent of the planet, is essential to understanding weather. For one, they produce rain, snow, hail and lightning and, therefore, hold clues to the microphysical processes in the atmosphere; two, they modulate the planetary energy budget (the amount of solar energy circulating in the planet) and the hydrological cycle; and three, they explain cloud-radiation feedback, or the dynamics of clouds’ interaction with solar radiation, which is necessary to predict climate change. Additionally, understanding them could help enhance artificial precipitation through cloud seeding. Our capacity to predict lightning, which kills thousands every year, too would improve if we understood clouds better. These floating entities can be studied well only by using remote sensing methods like satellites, radars and aircraft. So far, our understanding of clouds is very rudimentary. We know that they are a mass of very tiny droplets of water, one-hundredth of a millimetre in diameter, or ice crystals floating in the atmosphere, and are formed when water vapour condenses on a condensation nuclei, or an aerosol. As the droplets collide, some grow larger and start to fall. If the cloud is dense enough to form droplets greater than one tenth of millimetre in diameter, the droplets reach the ground as rain. All clouds do not precipitate, and even in the ones that do, the precipitation efficiency varies. Some clouds give a drizzle, others torrential rain. In numerical weather prediction models (these are mathematical models which take into consideration dynamics and physics of the atmosphere) to predict rain, representation of clouds and the precipitation processes is inadequate. We are not certain about the number of aerosols in a cloud or what a change in one variable might do to others. Most of the errors in predicting rainfall come from this inadequate representation. Even in coupled climate models, which take into account factors relating to oceanic processes as well as atmospheric circulations, improvements are needed to simulate monsoon conditions. This type of model requires a simulation of three dimensional cloud distribution and its effect on the atmospheric radiative budget. Clouds modulate planetary energy budget as they interact with both solar radiation coming from the sun and infrared radiation emitted by the earth and its atmosphere. The largest uncertainties associated with climate change projections are related to clouds. Clouds normally scatter solar radiation, but absorb infrared radiation. Low clouds scatter more solar radiation than they absorb infrared radiation, and thus have a cooling effect. However, high clouds have a warming effect because of high absorption of infrared radiation. With global warming, some prediction models say we are likely to have more low clouds, while others predict more high clouds. If we witness an increase in low clouds, we should expect reduction in global warming. Clouds, thus, have an important role in long-term climatic changes either directly through their impact on the radiative fluxes, or indirectly through their interaction with other variables such as atmospheric temperature, pressure, surface temperature and humidity. Understanding the cloud-radiation interaction is, therefore, essential to accurately simulate climate change patterns. A difference in cloud distribution can affect the simulation of surface energy budget and, thus, surface temperatures. However, quantifying the radiative impacts of clouds is quite difficult. For instance, water droplet distribution decides how reflective a cloud will be, but this distribution is difficult to measure. In 2009, the Union Ministry of Earth Sciences launched a programme to understand clouds and to improve their representation in weather and climate models. The Cloud-Aerosol Interaction and Enhancement of Precipitation is a national programme targeted to understand the interaction between aerosols and clouds and the microphysical properties of clouds. Under this programme, many observational exercises have been conducted, including aircraft observations. In the next three years, more exhaustive observational campaigns will be conducted to understand the precipitation enhancement processes (artificial rainmaking). The establishment of a high-altitude cloud observatory at Mahabaleshwar by the Indian Institute of Tropical Meteorology, Pune, in 2014 was another milestone in weather studies in India. Since the observatory is at a height of about 1.2 km, it works as a natural laboratory. Monsoon clouds forming in the valley pass through the various instruments kept at the observatory, allowing microphysical observations. These initiatives have added to our understanding of clouds, but there is still a long way before we can claim to have decoded the internal mechanisms of clouds. For more than a month, Satna district of Madhya Pradesh received deficient rainfall. And then, just in two days, 400 mm of intense downpour triggered severe floods in the entire district. In a normal year, the district would have received this much rain spanning over two months. In fact, “extreme” spells of rain—defined as rainfall above 204.5 mm in 24 hours by the India Meteorological Department (IMD)—have flooded several places across 18 states in June and July. Though deaths due to lightning are common during monsoon months, it was unprecedentedly high for four days. 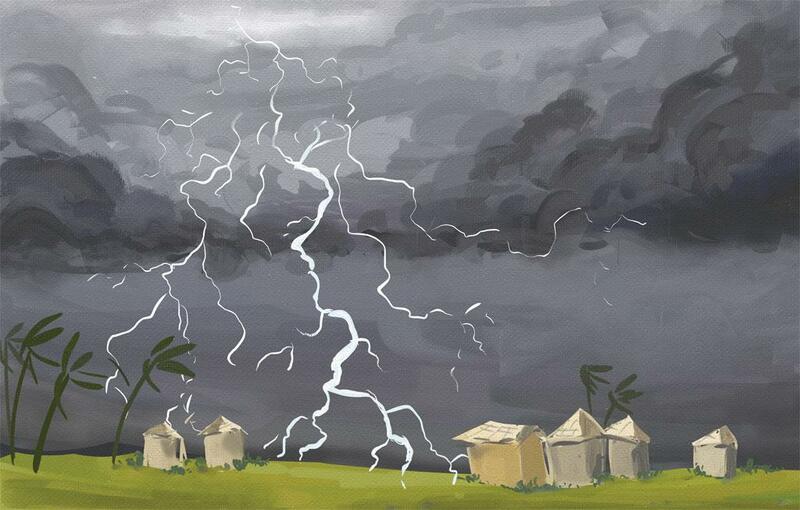 Between July 31 and August 3, at least 56 people died from lightning in different parts of Odisha. At least 400 people have been killed by lightning in eight states since the monsoon season began in June. The summer monsoon this year has also been unusually strong in China. It brought intense rainfall and caused flash floods, killing 400 people and displacing 100,000 in July. In early August, severe thunderstorms wreaked havoc in parts of the US. Similar incidences of intense storms, cloudbursts and flooding are becoming the norm worldwide. 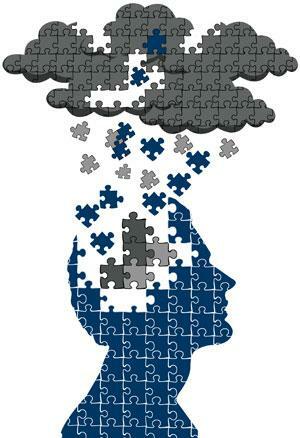 But scientists find it difficult to predict their onset despite advancement in weather models and satellite technology. A consensus has been building up that these uncertainties in predictive capability could be due to a missing link—clouds. 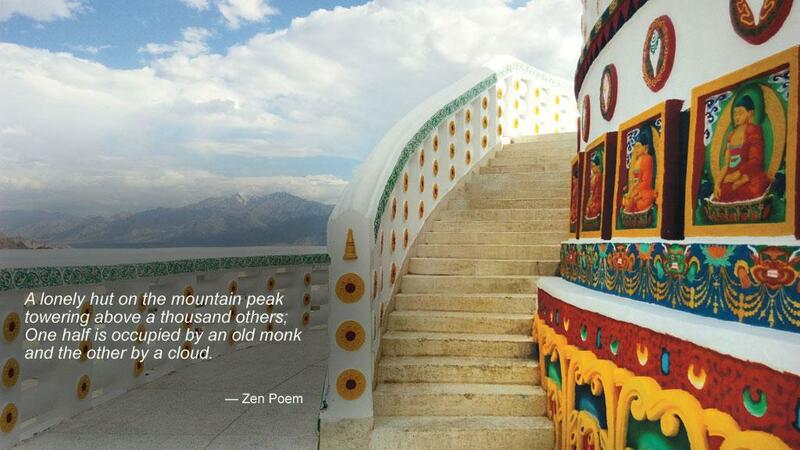 “Clouds are the carriers of weather, so to speak. 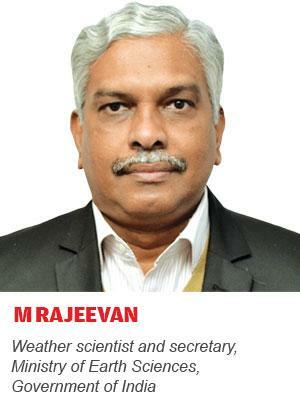 They enable hydrological cycles and are responsible for almost all precipitation,” says Thara Prabhakaran, chief project scientist of Physics and Dynamics of Tropical Clouds programme at the Indian Institute of Tropical Meteorology in Pune. They also act as the mediator between global climatic systems and their local manifestation. Yet, scientists know little about them, and barely understand how they affect weather, let alone climate cycles. As extreme and freak weather events become frequent with rising temperatures, scientists are scurrying to crack the mysteries behind clouds. So far, most scientists have zeroed in on one factor that plays a crucial role in the formation and evolution of clouds and thereby dictates its influence on weather—it is the aerosol. Hiding behind a complicated-sounding name, aerosols are microscopic organic and inorganic particles that are constantly being released into the atmosphere. These could be natural, such as dust, volcanic ash and vapours emitted by plants, or human-made, such as agricultural dust, vehicular exhaust, emissions from mines and soot from thermal power plants. These microscopic pollutants act as the sites where water vapour condenses to form cloud droplets. 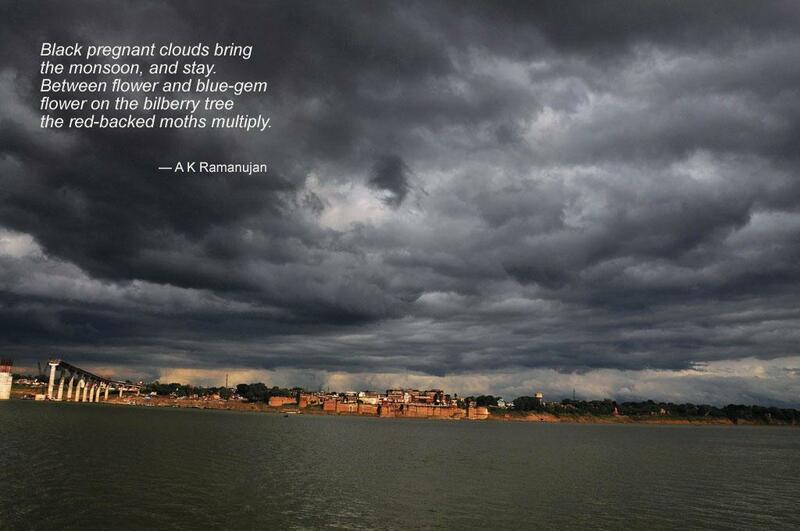 “The influence of clouds on weather appears to start at this minutest level,” says Prabhakaran. For instance, the type of aerosols and their abundance in the atmosphere dictate the behaviour of cloud—whether it will result in precipitation, bounce back solar radiation into space or trap the radiated heat. Local meteorological factors further influence cloud behaviour. Greater the number of aerosols, larger is the number of cloud droplets, says Daniel Rosenfeld, professor at the Institute of Earth Sciences, Hebrew University in Jerusalem. But more cloud droplets do not necessarily mean higher precipitation. As cloud water gets distributed among too many aerosols, they result in a large number of smaller droplets, which are slower to coalesce into bigger droplets that can fall as precipitation, he adds. In other words, polluted air often suppresses rainfall. A study, published in Water Resources Research in 2008, corroborates Rosenfeld’s observation. To understand how dust and precipitation are related, researchers from University of Virginia, USA, and NASA Goddard Institute for Space Studies analysed aerosol indices, wind directions and rainfall data of the Sahelian stretch in Central and North Africa for the period of 1996-2005. Their analysis shows that dust from the region was suppressing rainfall. The fine dust particles in the region resulted in a large number of seeding sites of cloud droplets, which prevented the formation of droplets of the size required for rainfall, the study notes. While this is usually true for shallow clouds, Rosenfeld says polluted clouds are capable of causing greater havoc. Polluted clouds at times grow to greater heights due to convection, says Rosenfeld. At this level, the behaviour of cloud droplets changes. They attain sufficient size to start coalescing into bigger droplets that can fall as precipitation. Unfortunately, these clouds, known as cumulonimbus, are responsible for extreme events such as tornadoes, hailstorms, severe dust storms, squalls and cloud bursts, says M Mohapatra, head of the Regional Specialised Meteorological Centre at India Meteorological Department in Delhi. If a cumulonimbus cloud, with a large number of aerosols, grows beyond the freezing level, it results in a large number of free ice pellets in the upper parts of clouds. The continuous and rapid vertical flows of water and ice pellets within clouds create an enormous amount of static energy, which in turn results in lightning and hailstones. Several studies have shown that volcanic eruptions are usually followed by bouts of lightning because of high levels of aerosol loading in the clouds. 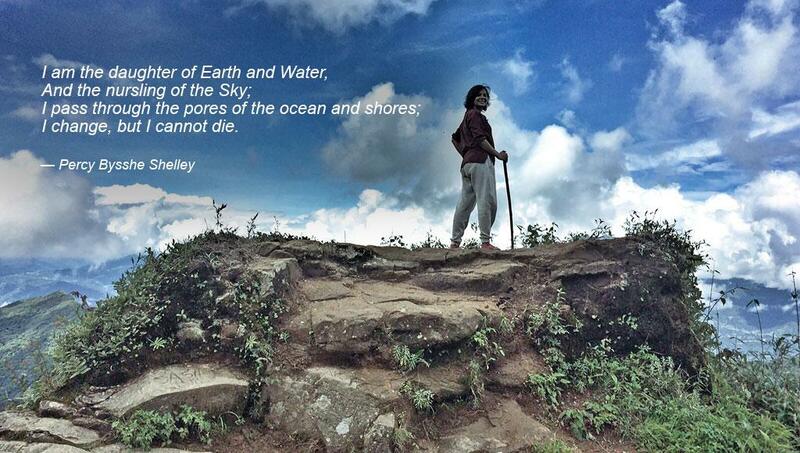 This observation can be applied to understand why lightning-related deaths are common in certain places in India. Lightning is the leading weather-related cause of death in the country. Since 2000, over 30,000 people have died due to lightning strikes. 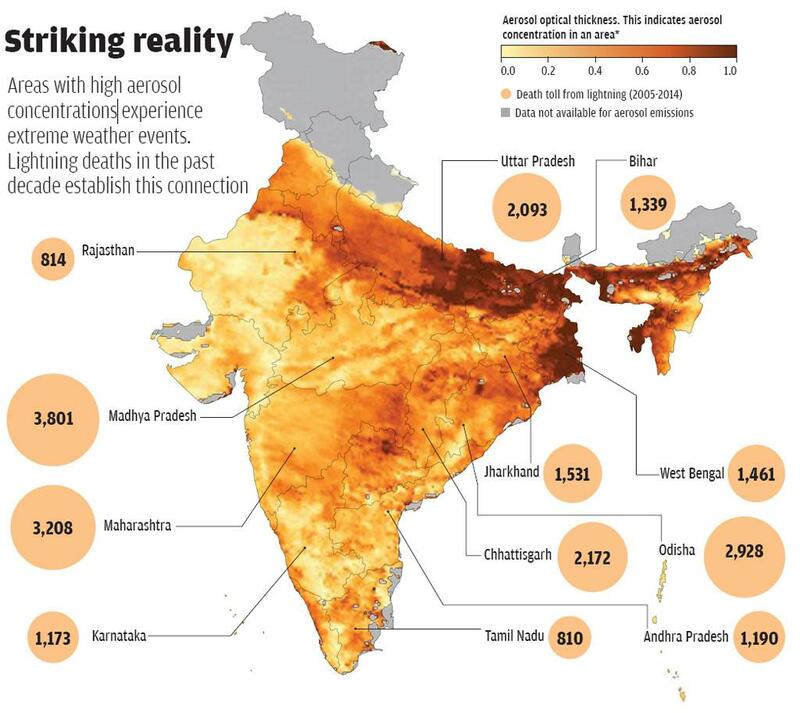 Although no event-specific studies have been conducted to confirm this link, a comparison of the regions chronically affected by lightning with an aerosol emission map of India shows a strong correlation (see ‘Striking reality’,). Aerosol loading over the mainland is highest along the Gangetic plains in the northern and eastern parts of the country, in Central India and in the Deccan Plateau. These regions are home to most polluting industries. People here also burn organic and farm waste on a large scale. And these are also the regions that report maximum number of lightning deaths. 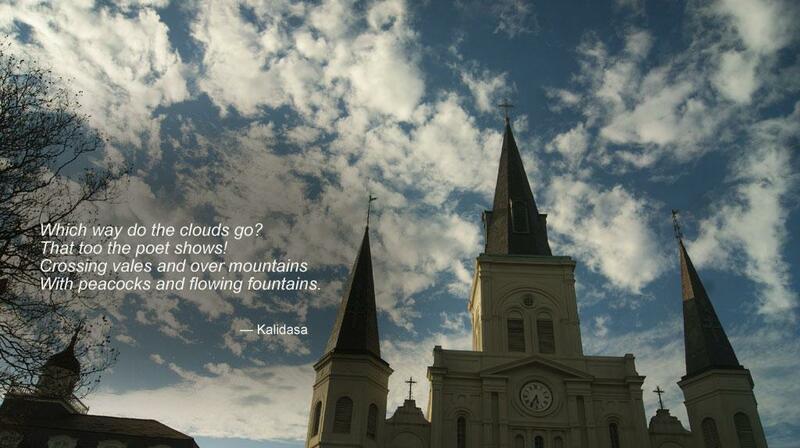 Besides, tall clouds serve as a vertical pathway for energy flow. 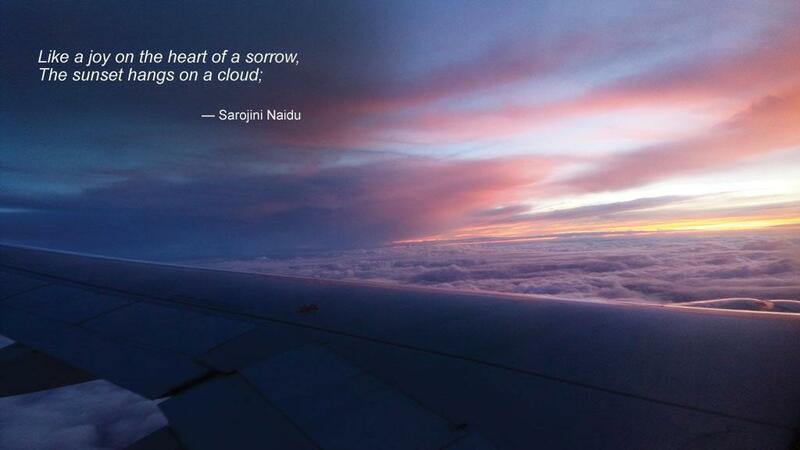 “This is what we feel as turbulence while travelling in an aircraft that moves through a cloud,” says Mohapatra. The water droplets and ice within clouds constantly and rapidly move up and down and undergo a lot of collision, making them extremely volatile and dangerous. Aerosols can have an invigorating effect on this volatility. A trigger is all that is required for the entire water content of the cloud to be unleashed at once, he adds. This is the reason tall clouds often result in cloudbursts as they move along the Himalayan slopes. Still extreme precipitation is just one of the possible side-effects of cumulonimbus clouds. They can generate high wind speeds. An abundance of aerosol particles in such a cloud system can extend their size and lifespan by delaying rains and causing extreme storms when the rains finally arrive. This results in extreme events such as tornadoes, dust storms and squalls, says Mohapatra. A recent study by researchers from the University of Texas at Austin in collaboration with the University of Colorado Boulder and NASA’s Jet Propulsion Laboratory validates Mohapatra’s caution. The researchers analysed geostationary satellite data of 2,430 cloud systems and concluded that aerosol concentration could increase the lifespan of storm systems by as much as three to 24 hours, depending on local meteorological conditions. “High concentrations of aerosol particles cause a reduction in droplet size, which could delay precipitation, and in the case of storm clouds we have seen that it contributes to the extension of the life and intensity of the storm,” says Sudip Chakraborty, lead author of the paper that was published in the Proceedings of National Academy of Sciences in June this year. While there is no dearth of hypotheses that say cumulonimbus clouds mostly result in extreme weather events, the study led by Chakraborty is the only study that shows the role of aerosols in altering the cloud’s properties. The main reason for this is the dearth of data regarding cloud properties, says Sagnik Dey, assistant professor at the Centre for Atmospheric Sciences, IIT-Delhi. As data quality and quantity both improve with the availability of more sophisticated and detailed satellite imagery, researchers are taking more interest in studying how changing cloud properties are resulting in freak and unusual weather events. The Indian summer monsoon season begins when the land surface becomes hot enough to drive a powerful rising motion of air in the atmosphere, producing heavy precipitation. Cooler, humid air over the Arabian Sea flows inland to compensate for the rising air. Air in this compensating circulation encounters the surface heating and also rises, perpetuating the cycle. This simple thermodynamic system is associated with a cloud response that varies in scale from microns to thousands of kilometres, simulated by some of the most powerful supercomputers ever made, and observed by a massive network of weather stations and dozens of advanced satellites. At the smallest scales, an increase in tiny particles in the atmosphere can shade the land surface while absorbing sunlight aloft, causing a reduction in the heat that reaches the surface. This weakens the rising motion of air that drives the precipitation response to the monsoon. Clouds that do form in these polluted environments are less likely to rain and more likely to persist because the droplets are smaller. These longer-lived clouds further cool the surface and weaken the circulation. The extent to which pollution affects clouds, precipitation, and, therefore, agriculture in India is still an open question and an active area of research. This work is carried out by dozens of institutions globally, each using advanced models and extremely powerful computers to simulate the billions of microscopic processes occurring every second. At larger scales, the microscopic processes obtained in cloud models show how changes in pollution lead to changes in the types of clouds. Weather observers across India have for years provided observations to show a significant reduction in the cloud types associated with a strong monsoon, accompanying an increase in pollution. The number, quality and consistency of these observations have contributed to one of the longest cloud records ever produced. This record is the result of decades of continuous observations with no change in observing procedures, and years of meticulous data processing, filtration and statistical analysis carried out by research groups globally. At even larger scales, the amount of heat and moisture moved by the Indian monsoon is significant enough to change the large-scale planetary waves that drive weather globally. Other tropical circulations have been shown to have significant effects as well. A global network of weather stations as well as cloud-observing satellites have shown that the Indian monsoon alone is significantly correlated with changes in cloudiness over six continents. The range of cloud response to the Indian monsoon shows how the cloud record is a powerful tool to study climate change. Recent studies have shown that clouds associated with the mid-latitude storm track (routes of stormy planetary winds seen in the middle latitudes) have, on an average, been displaced poleward. The mean location of the storm track is sensitive to the temperature gradient between the equator and the poles, and a poleward shift would be consistent with a reduction in this gradient, which has indeed happened because of the disproportionate warming of the polar regions. This is an ominous sign of global warming shown using two completely independent data sources, one based on satellite cloud observations, the other from surface weather stations. Lower-level clouds are sensitive to large-scale circulations and local changes in temperature and pollution. Apart from the above example regarding pollution possibly affecting the monsoon, low clouds over the tropical oceans are sensitive to the temperature of the sea surface. A warming ocean is more likely to reduce the atmospheric stability that supports the existence of large-scale stratiform cloud decks (which are low-hanging clouds that grow horizontally on a semi-uniform base). It also drives a decline in cloud cover, an increase in sunlight reaching the ocean surface and further warming of the ocean in an example of a positive feedback cycle. However, an increase in pollution could have a competing effect, increasing the lifetime of clouds. The single phenomenon of the Indian monsoon well represents the complexity of the physical systems associated with clouds and the challenges faced by the communities observing and modelling clouds. Each community contributes to a different, essential understanding of the system. Cloud models provide a picture of the internal workings of clouds and how cloud droplets interact with one another, which cannot be seen by observers at the surface or from satellites. Aircraft data are also used to test cloud-modelling results, but are currently in short supply. Surface observers and long-lived satellites contribute to a record that is long enough to distinguish trends in cloud cover from changes that are driven by cyclical variability in the system. Satellites offer a valuable, but lower-resolution view of systems like the Indian monsoon over the entire planet, many in places where observations from the surface are lacking. Each branch within the cloud climatology community relies on the other to advance the science. Simulated processes need to be compared to real-world observations to verify results. Observed phenomena require not only physical explanations tested in cloud models, but independent verification between observing platforms. The above examples outline how the cloud record can be used to study atmospheric changes on scales ranging from microscopic to global, from the surface to the stratosphere. The most difficult work going forward will be in improving our understanding of how clouds will interact with a changing atmosphere and whether changes in cloud cover will act to exacerbate or offset global warming. It is essential that we continue to maintain the current observing platforms in order to better diagnose changes in the atmosphere, while simultaneously, we must continue to invest in improved cloud modelling to better understand the causes and effects of cloud changes. Powered by winds, clouds have been circulating around the globe like magic carpets carrying weather on their back. Understanding them not only holds the key to decoding changing weather patterns, it is also crucial for predicting a change in climate. What matters to climate is how the behaviour and extent of clouds have changed over 250 years or will change in the future, says Neil Donahue, Lord Professor of Chemistry at Carnegie Mellon Univer sity, Pittsburgh. To understand these changes climate scientists, armed with constantly improving technologies and weather satellite data, are busy untangling the journey of clouds—right from the level of microscopic aerosols, which act as the seed of cloud droplets, till they become the most crucial player in the climatic system. But clouds keep changing and reorganising themselves. 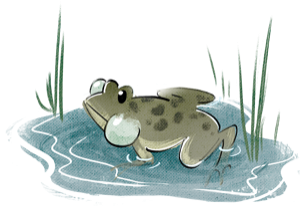 Their character has become even more uncertain in a changing climate. And this has made the job of scientists more challenging. 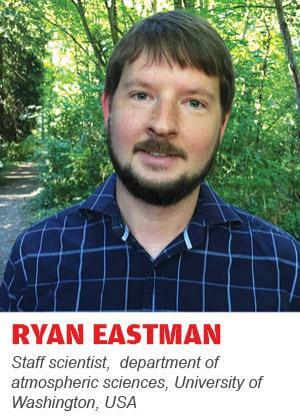 One of the many puzzles that climate scientists are trying to unravel is whether aerosols released by human activities, such as vehicular and industrial emissions, affect the formation and behaviour of clouds. Going by the conventional theory, high aerosol loading in the atmosphere results in more number of cloud droplets, and that make the sky appear cloudy. Since the concentration of aerosols would have been low before the industrial era began in the 1800s, it is believed that the pre-industrial atmosphere must have been less cloudy than what is observed now. Cloud droplets also reflect part of the solar radiation back into space, and thus have a cooling effect on earth. By this logic, clouds in the industrial era would have higher cooling effect on earth. Some speculate that this cooling effect masks the warming effect of greenhouse gases (GHGs) released into the atmosphere in the industrial era. “Our best estimate is that about one-third of the extra warming that would have been caused by carbon dioxide has been masked by that pollution, and we do not really know exactly how much hotter it will get if and when we get rid of that,” says Donahue. The uncertainty is due to the lack of reference data on atmospheric observations from the pre-industrial era. Scientists at Switzerland’s European Organi zation for Nuclear Research, known as CERN, tried to address this uncertainty early this year through a high-tech experiment, aptly named CLOUD (Cosmics Leaving Outdoor Droplets). They simulated the pre-industrial era atmosphere under highly controlled conditions, and found that in the absence of GHG emissions, natural aerosols or biogenic vapours released by trees were capable of supporting the cloud cover, similar to the present-day situation. CERN researchers are now studying the effects of cosmic particles in solar radiation on cloud formation to understand how present-day atmosphere is different from that of the past. Then there are studies that are trying to bring new insights into the formation of cloud droplets. Scientists from the University of Bristol in the UK and the ETH Zurich University in Switzerland in 2012 debunked the conventional wisdom about cloud formation. They said droplet formation on organic aerosols, which are usually byproducts of combustion processes, is not a uniform process, and that it could take anywhere from less than a second to several hours depending on the viscosity of the aerosol particle. The less soluble an aerosol, the longer it would take to form droplets, said the researchers. In March this year, researchers at the US Department of Energy’s Lawrence Berkeley National Laboratory also tried to understand the microprocesses involved in cloud formation by using a proxy mix of organic and inorganic aerosols to emulate the atmosphere. They observed that more than the solubility of aerosols, what mattered most is the interaction at the interface of the aerosol and condensed water vapour. Organic aerosol particles effectively push down the surface tension of water to facilitate efficient formation of bigger cloud droplets, they concluded. While specific connections between the chemistry of aerosol particles and the formation of cloud droplets is yet to be ascertained, the findings hold tremendous value for understanding the microprocesses that decide the brightness or precipitation potential of clouds. Clouds are a key component of the climate system because they help regulate the planet’s temperature. 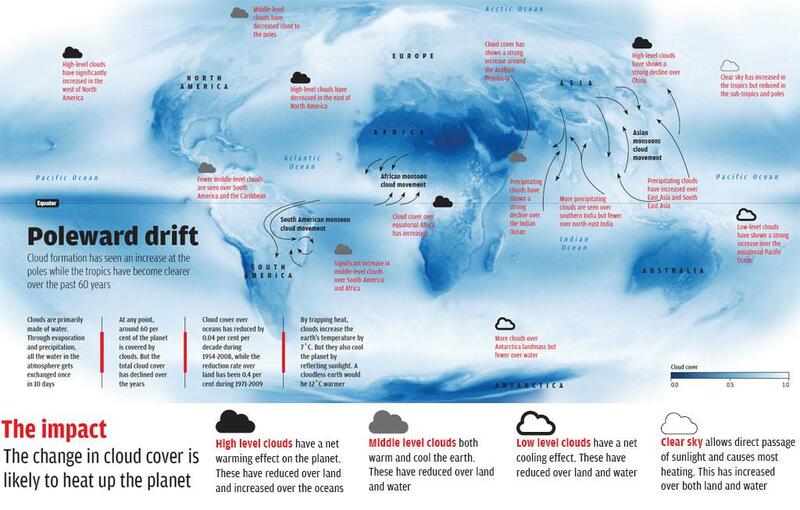 Clouds are responsible for both heating up and cooling down the planet, depending on their type and where they are located (see ‘Poleward drift’). For instance, when located at lower altitude, clouds typically contribute to the cooling effect by shielding the planet and reflecting around half of the sunlight that strikes them. It gives them the white glow. It is estimated that if cloud cover were absent and all the water in the clouds existed as water on the surface of earth, the planet would have absorbed about 20 per cent more heat than what it does currently. This would have made the earth warmer by about 12oC. But when situated higher up in the atmosphere, they trap the infrared radiations bouncing off the earth’s atmosphere, thus warming the planet to the tune of about 7oC. Understanding this dual nature of cloud is important because it shows how changes in clouds will affect the energy balance and radiation budget of the planet. “Clouds have a net cooling effect in the current climate,” says Joel Norris, Professor of Climate and Atmospheric Sciences at the Scripps Institution of Oceanography in San Diego, California. This is because the cooling effect of clouds outweighs their warming effect. However, there is a confusion. No one is sure if the net cooling effect will become stronger or weaker as global warming progresses, he adds. However, advanced remote sensing technology and satellite imagery over the past three decades have helped scientists make some headway on understanding how clouds have been changing and reorganising themselves. Researchers from the University of Washing ton and University of Arizona in the US have compiled meteorological data for the period of 1954-2008 from weather ships to map the changes observed in clouds over oceans. They have also created a map of cloud cover changes over land by using weather station data between 1971 and 2009. The maps indicate significant changes in their extent. While cloud cover over oceans shows subtle reduction, it is fast receding over land. Besides, mid-latitude cloud cover is reducing over the tropics, while all kinds of clouds are expanding over the sub-tropics and high-altitude clouds are migrating towards the poles. NASA confirmed the observation in May this year. The migration of high-level clouds towards the poles is worrisome. Considering the massive amounts of water stored at poles, the increase in warmth could ultimately contribute to sea level rise around the world. The catastrophic results are already visible. The world’s second largest ice sheet, situated in Greenland, is melting rapidly due to the blanketing effect of clouds which are raising temperatures in the region by 2-3oC. It is estimated that a third of the total global sea level rise currently is being forced by this melting. Researchers at the Scripps Institution of Oceanography say clouds are not only moving polewards, they are moving higher up in the atmosphere. Norris, lead author of the paper, says expansion of the subtropical dry zone will lower the reflection of solar radiation back to space by clouds and allow earth to absorb more solar radiation. This would result in a warmer climate. “I have also found a rise in the height of the highest cloud tops. This is expected to occur with global warming,” Norris adds. As the lower atmosphere warms up and upper atmosphere cools down, it will allow buoyant clouds to rise higher in the sky. These clouds would trap heat and this would result in a considerable warming of the climate. 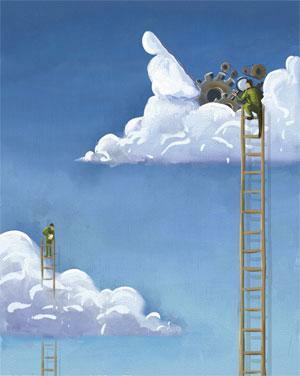 Research on clouds has no doubt picked up considerable speed in recent years. Several data-gathering projects are simultaneously using ground observations, remote sensing, weather balloons, specially equipped planes and satellite imagery to try and produce a coherent picture of how clouds are responding to climate change. Despite this, the problem of assimilating clouds in weather and climate models remains. “Clouds have not been incorporated in climate models very well because the resolution in models is crude. They have to be deduced, and this is imperfect science,” says Kevin Trenberth, senior scientist at the Climate Analysis Section, the US National Center for Atmospheric Research. “Climate models cannot handle the physics of clouds directly and parameterise (inspired guesswork) their properties,” says Roger Davies, professor of climate physics at the University of Auckland in New Zealand. Neither can they handle the heterogeneity of real clouds that affect their radiative properties, and work with average cloud properties. Since the radiative and moisture properties of clouds average differently, model clouds tend to be either too bright or too dry, says Davies, adding that modellers choose to make clouds too dry. Davies says most confusion about cloud change is due to paucity of quality satellite observations. Global coverage is essential to get enough samples, and satellites are the only option. The early satellites focused more on weather imagery than climate measurements. “We have only had about two decades of quality measurements, and it will take several more decades to draw strong observational conclusions about cloud changes. In the meantime, the conclusions are subject to change as more data becomes available,” Davies explains. 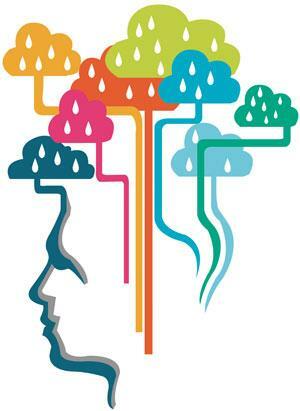 While we wait for more information on how cloud behavioural changes manifest on the ground and how adverse effects can be mitigated, it seems safe to say that unusual and extreme weather patterns are here to stay. Geoengineering is an emerging branch of climate science to find out ways in which planetary processes can be modified to our advantage. 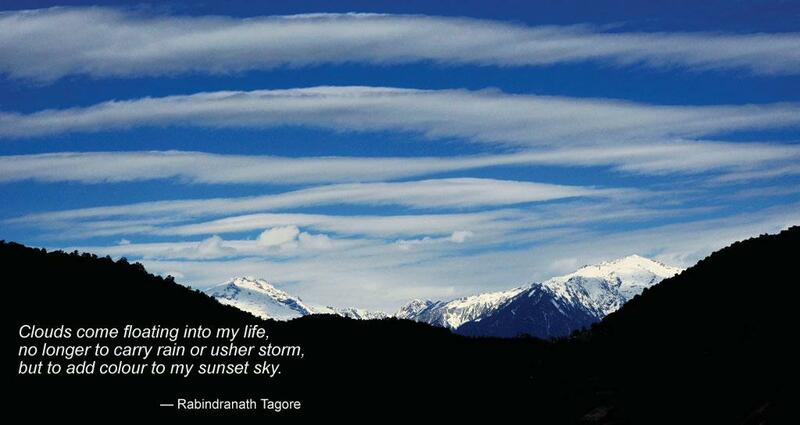 Clouds are one of the most accessible avenues where such changes can be made. The fact that aerosols (microscopic solid or liquid particles floating in air) have the ability to influence cloud properties can be used to make them reflect a greater amount of solar radiation or to bring rain. 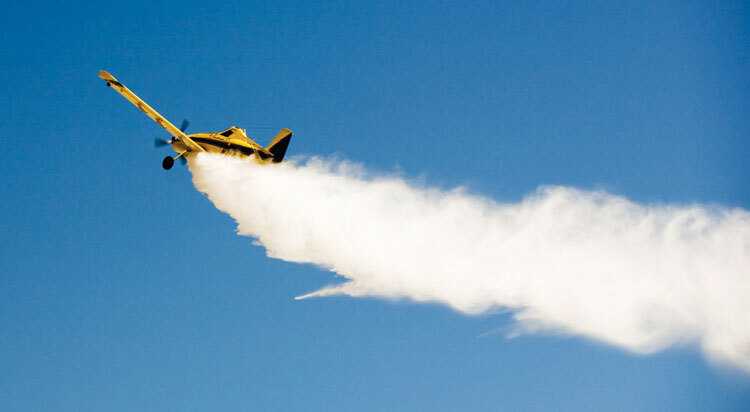 Cloud seeding is the manipulation of clouds through the use of aerosols to increase precipitation. The process involves infusing clouds with additional aerosols (the most common is silver iodide) from an aircraft. An increase in aerosols means an increase in the number of particles around which water vapour can condense. Under suitable environmental conditions, this can increase rainfall. Clouds have another critical role. They regulate the amount of sunlight reaching the earth and the amount of heat earth radiates into space. This dual role can be manipulated through aerosols to mitigate anthropogenic warming. The idea is to whiten clouds by infusing it with aerosols and to increase their reflectivity so that more sunlight is reflected. This requires shooting up jets of seawater sprays into the atmosphere so that the salt aerosol particles can induce whiter and more reflective cloud cover. Another ambitious proposal involves seeding aerosol particles in the upper troposphere, where icy clouds trap the infrared radiation reflected by earth. The idea is to make this layer thinner so that it allows more infrared radiation to escape into space. 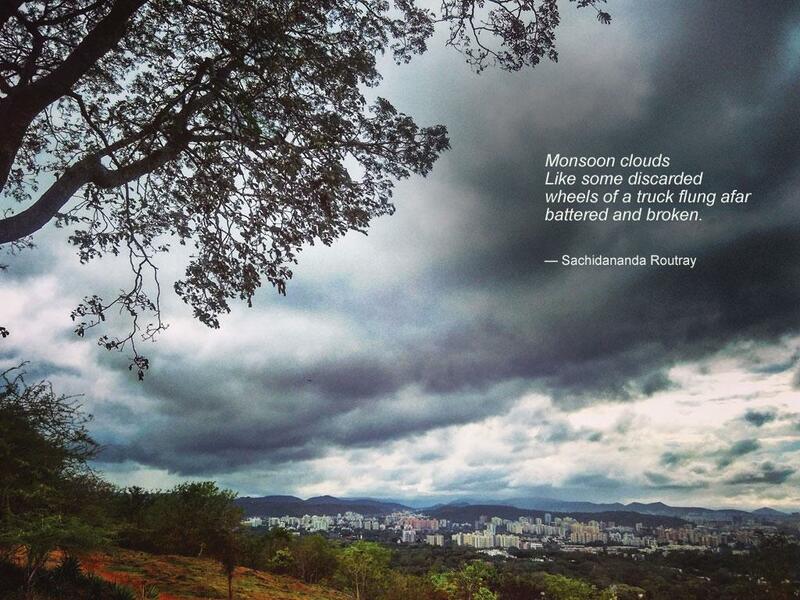 In India, cloud seeding experiments have yielded mixed results over the past six years. But the technology is being extensively studied in countries like China, which has spent over a billion dollars on rain creation to meet increasing demands for freshwater since 2008. Geoengineering, however, faces severe criticism as it offers short-term mitigation. It could unleash a cascade of short- and long-term impacts that are beyond imagination because the variables in atmospheric and oceanic sciences are still relatively unknown. Wildlife conservation and management have been chronically obstructed by the difficulty in precisely marking habitats and describing biodiversity. But it has been found that tracking the water cycle through clouds could help identify specific animal and plant habitats. Researchers from Yale and Buffalo universities of the US have identified sizes and locations of some important habitats using cloud cover data. Clouds are inextricably linked to environmental factors such as rainfall, sunlight and surface temperature. Any change in these factors will impact cloud. Since these environmental factors are central in determining areas where plants and animals can survive, scientists have made use of cloud cover data to learn more about habitats and the biodiversity they harbour. The researchers used 15 years of data from NASA's Aqua and Terra satellites to build a database of two cloud cover images per day for almost every square kilometre of the earth. Analysing the data, they found that observed variations in the cloud cover sharply matched the peripheries of biomes that were home to unique species. 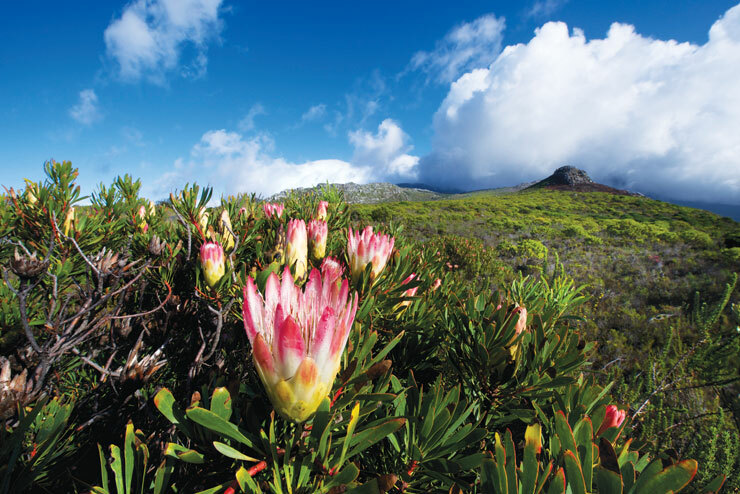 Looking at the variations and patterns in cloud cover, researchers could predict habitats specific to montane wood-creeper, a bird from South America, and king protea, a plant from South Africa, in unprecedented detail. The study was published in PLoS Biology in March this year. 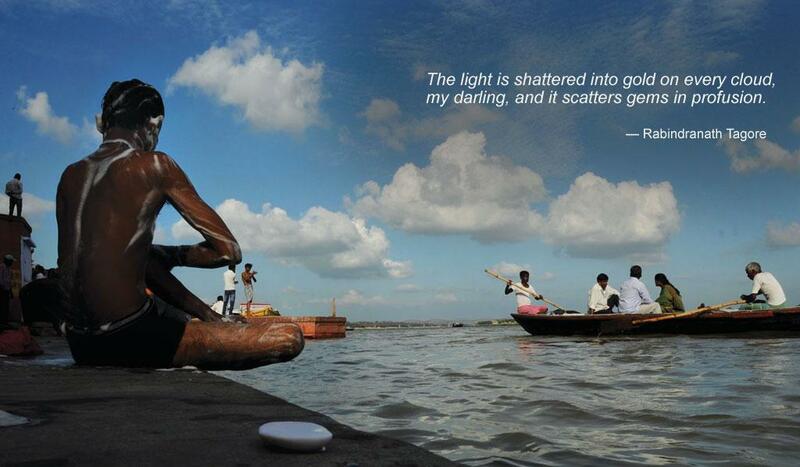 Adityat Jayati Vrishti (the sun gives birth to rain),” reads a line from the Brihatsamhita. Written by sixth century astrologer-mathematician Varahamihira of Ujjain, the line shows a deep understanding of cloud formation and rain.